The following is a description of Covington as printed in a real estate sales brochure in 1887. The glowing language of real estate sales brochures has been around for hundreds of years, but the editor of the St. Tammany Farmer liked this one so much he decided to print it in the newspaper. It contains considerable detail while describing life in Covington, the background of how the community began, and how it came to prosper in good times and bad. "We have received, from Col Geo. Moorman. Secretary of the Covington and St. Tammany Land and Improvement Company, a neatly printed and finely illustrated pamphlet descriptive of our town and parish, and showing our advantages both as a summer and winter resort, and a home for immigrants." The following is the text of the 1887 brochure describing Covington. 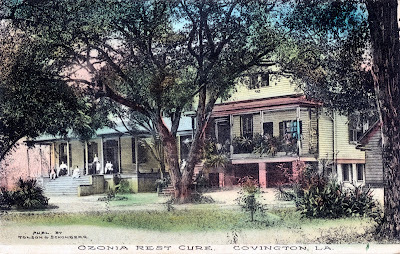 "Covington is on the Rivers Bogue Falia and Tchefuncta, just above their junction, about thirty miles north of New Orleans and nine miles from Lake Pontchartrain. 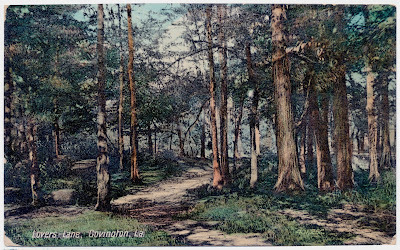 It was first incorporated under the name of Wharton, but by an act of the Legislature of 1816, the name was changed to Covington. For many years it was the only shipping point for all the cotton raised in a large portion of the Florida parishes and the southern portion of the State of Mississippi. 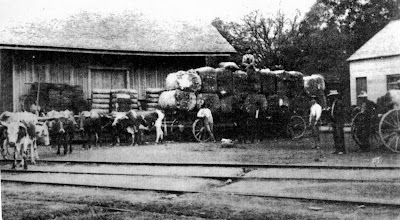 After the New Orleans and Jackson Railroad was built, it lost its entire cotton trade, and for many years it did not ship a bale. The land around it was considered entirely valueless for agriculture, and nothing but bricks, lumber, tar, wood and sand were shipped from the Tchefuncta river. With the end of slavery came a new era; the brick and lumber business almost ceased, and people were forced to turn their attention to the soil. In a faint-hearted way a few experiments were made; the results were surprising to every one. The cotton crop has increased year by year, and the last season Covington shipped over 4000 bales. About 1856 it was discovered that some of the wells and springs were medicinal in their nature; since then the town has been a place of resort for invalids. It has now about 750 inhabitants, twelve stores, two butcher shops, two bakeries, four churches, two blacksmith and wheelwright shops, one barber shop, one drugstore, one newspaper and job printing office, two schools, a tanner, a tailor and shoemaker shops. Being the parish seat, it also contains the Courthouse. It is about thirty feet above the level of the rivers that flow on either side, furnishing navigation for steamboats and schooners at all times in the year. The land is high and dry, covered with beautiful forests of pines, oaks, magnolias, beeches, gums, and various other trees, intersected by romantic roads and walks, and under all an unlimited supply of clear, sparkling and perfectly pure artesian water. Above the town the rivers become rapid streams, with banks and bottoms of pure white sand; over this the clear water runs and dances with many a rapid, many a dark, still pool, and many a turn and crook. The trees meet overhead, the fish dart and leap underneath; the yellow jasmine throws its golden garlands from tree to tree. The fringe tree, wild honey suckle, and numerous shrubs, wave their bouquets on all sides, and the magnolia grandi flora towers above all, laden with its magnificent snowy blossoms, and filing the air with its subtle fragrance. The banks of these rivers are high, dry and firm; no swamps can be found. A hundred yards or so from the banks, the forests are so open and the ground so firm that wagons can be driven in all directions. Owing to the nature of the soil, the roads are never boggy; they soon become dry after the heaviest rains. The scenery, soil, climate, waters, health and location of Covington make it the point above all others for a large winter sanitarium, where thousands of invalids and tourists can find a refuge from the rigors of the Northern winters, and experience the curative effects of its waters and air. There are several conditions which combine to make this the healthiest spot in this country; the ground in high and dry, no swamps or marshes exist. There is nothing to produce malaria, and it is unknown. The long leaf pine covers the country, and under its lofty crowns there is no undergrowth to impede the free circulation of the air. The resinous leaves impregnate the atmosphere with their odor, purifying and making it grateful to the lungs; the water is pure and protected from all danger of surface contamination; above all, it is free from the dampness of the Gulf coast. Typhoid Fever—Since 1860 there has been but one death from typhoid fever in Covington; this case was undoubtedly contracted elsewhere, and the disease did not spread. Pneumonia—One death. This was the case of a colored man who had been badly wounded and was much exposed during the Coldest weather we have ever known at this point. Small-pox—Three imported cases and no deaths, and the disease did not spread. Scarlet Fever—Two imported cases; no deaths, and the disease did not spread. Yellow Fever -Two cases imported in 1867 The disease did not spread, although many were in contact with the patients, and the two funerals were largely attended. 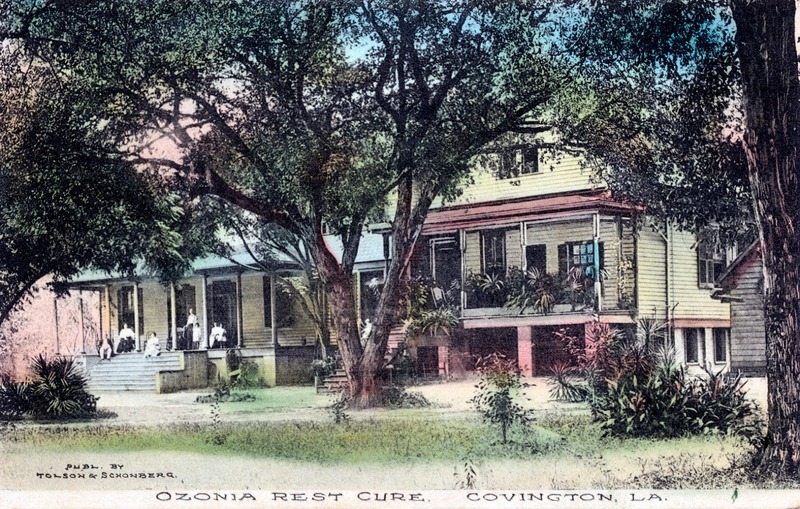 In 1876, thousands fled to Covington, and though the town had daily communication with New Orleans, and no quarantine, not a case of fever of any kind occurred. No resident of the town was ever known to suffer from any disease of the kidneys or bladder, and the waters have cured many such cases. The doctors of New Orleans have such a high opinion of the curative effects of the air of Covington upon diseases of the throat and lungs, that numbers of patients are sent here annually, and many wonderful cures have been effected. We do not pretend that all consumptives can be cured by this atmosphere, but we do assert that the disease in its early stages is almost in variably arrested, and in many extreme cases the life of the patient has been prolonged for years. Fevers are rare and never serious in their nature. There have been no deaths from dysentery, and our waters are regarded as an infallible cure for this disease. The cemetery, which has been used since the town was settled, is 300 feet square; one-half of it is still vacant, though it has been used by the neighborhood for miles around. " In the introductory remarks the Company truly says:"We are not engaged in building a town on paper, nor are we seeking to sell a barren tract of land at many times its real value, by mapping out imaginary squares and streets. We have no lots to giveaway at the cost ot recording the title, nor any schemes of that nature. We have bought a valuable tract of land, comprising unimproved portions of an old well-known town, and adjacent therein. We expect to make valuable improvements at our expense, and not by assessments on lots donated for the purpose of entrapping the unwary. We believe that we own the site of the future sanitarium of country, and our lots are to be sold at fair market prices." "The (real estate brochure) book contains maps of New Covington and the lines of communication with New Orleans by rail and river; also the following full-page illustrations: Bank Hotel, in Covington; Pine Forest on the Company's Land; Wood Landing on Tchefuncta River, near Covington; View from Covington Bridge, on the Bogue Falia; Page's Mill, on the Little Bogue Falia; Bogue Falia River at Sulphur Springs, near Covington, (two views;) Capt. Weaver's residence, in Covington; Schooner Landing, at Covington Wharf; Episcopal Church, in Covington; Hon Jas. M. Thompson's residence, in Covington; Louisiana Avenue, in Covington; Fairview, on Tchefnncta River, near Covington; View from Goodbee's Bridge, on the Bogue Falia Bridge, near Covington; Steamer New Camelia, at steamboat landing, on Bogue Falia River, near Covington." Click on the image to make it larger and more readable.